One of London's most famous landmarks built to commemorate the Great Fire of London has reopened to the public after an 18-month restoration. 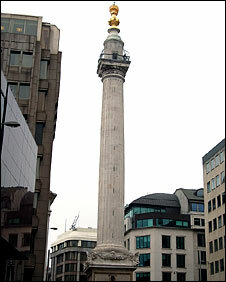 The Monument, in the City of London, welcomed visitors from midday on Monday following a £4.5m face-lift. Restorers have cleaned and repaired its stonework and regilded its famous golden orb. The site was designed by Sir Christopher Wren and Robert Hooke to commemorate the fire of 1666. The fire began in a baker's house in Pudding Lane on 2 September, 1666, and was finally extinguished after burning for five days and destroying much of the city. Repairs to The Monument are carried out roughly every hundred years, with work last undertaken in 1888. It is located at the junction of Monument Street and Fish Street Hill 202ft (61m) from the spot in Pudding Lane where the Great Fire is thought to have started. The Monument is the tallest isolated stone column in the world, towering above the city at 202ft (61m) and has a spiral staircase with 311 steps leading to the observation platform.